In 1936, the Italian aircraft manufacturer Officine Meccaniche Reggiane (Reggiane) branched out to produce aircraft engines. Initially, Reggiane produced Piaggio and FIAT engines under license, but it was not long before the company began to develop its own aircraft engines. As world events unfolded in the 1940s, only one model of Reggiane’s aircraft engines was built, and it did not proceed beyond the testing phase. 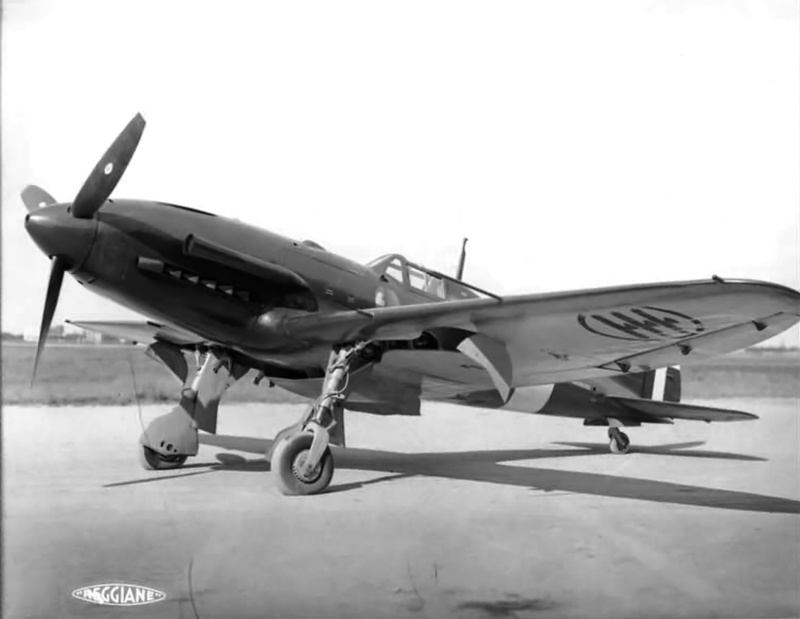 The Reggiane Re 103 RC50 I engine in April 1942 before spark plug wires and fuel lines were added. Note the two spark plugs per cylinder. 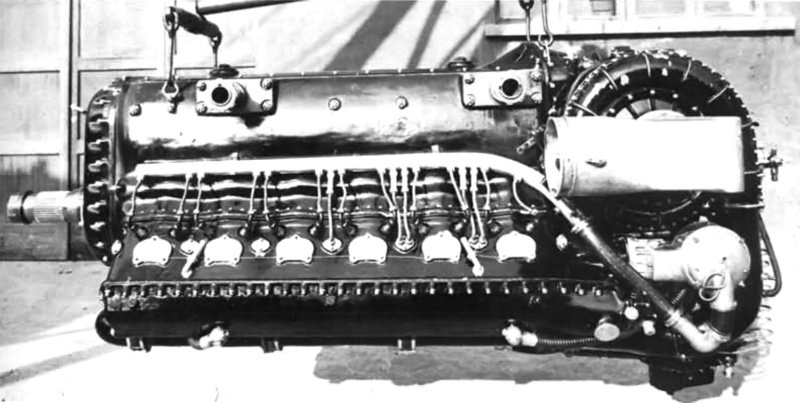 Reggiane’s first aircraft engine design was the Re 101 RC50 I*. The “R” in the engine’s designation meant that it had gear reduction (Riduttore de giri); the “C” meant that it was supercharged (Compressore); the “50” stood for the engine’s critical altitude in hectometers (as in 5,000 meters), and the “I” meant the engine was inverted (Invertita). Occasionally, a letter was added to designate the engine’s configuration, as in “L” for inline (Linea) appearing as Re L 101 RC50. Proposed in the late 1930s, the Re 101 RC50 I was an inverted, liquid-cooled V-12 of 1,635 cu in (26.8L). Although its bore and stroke have not been found, they were probably around 5.51 in (140 mm) and 5.71 in (145 mm) respectively. The engine produced 1,200 hp (895 kW) for takeoff, 1,100 hp (820 kW) at 16,400 ft (5,000 m), and weighed 1,477 lb (670 kg). The Re 101 RC50 I engine possessed similar specifications to the Rolls-Royce Merlin but did not proceeded beyond its initial design. Reggiane’s next engine, also designed in the late 1930s, was the Re 102 RC50 I. 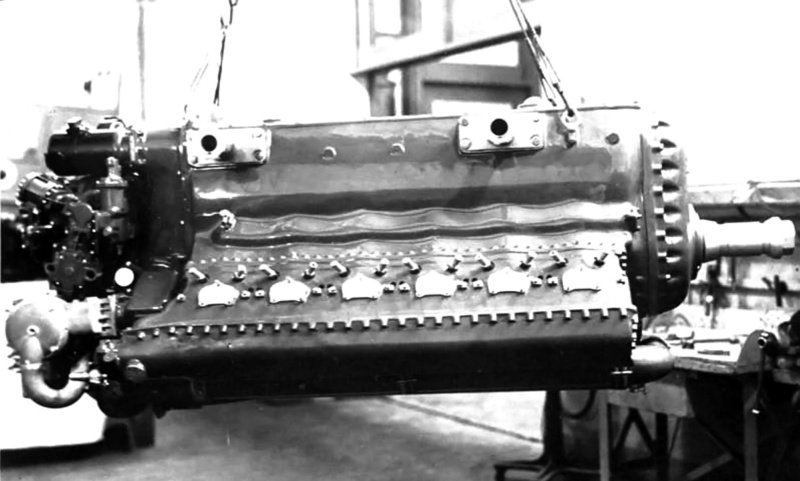 The engine was an inverted W-18 (sometimes called an M-18, “M” being an inverted “W”), with three banks of six cylinders. The Re 102 RC50 I displaced 2,075 cu in (34 L), produced 1,550 hp (1,156 kW) for takeoff and 1,350 hp (1,007 kW) at 16,400 ft (5,000 m), and weighed 1,676 lb (760 kg). The engine’s bore and stroke have not been found, but were probably around 5.28 in (134 mm). The Re 102 RC50 I did not proceeded beyond the design phase. 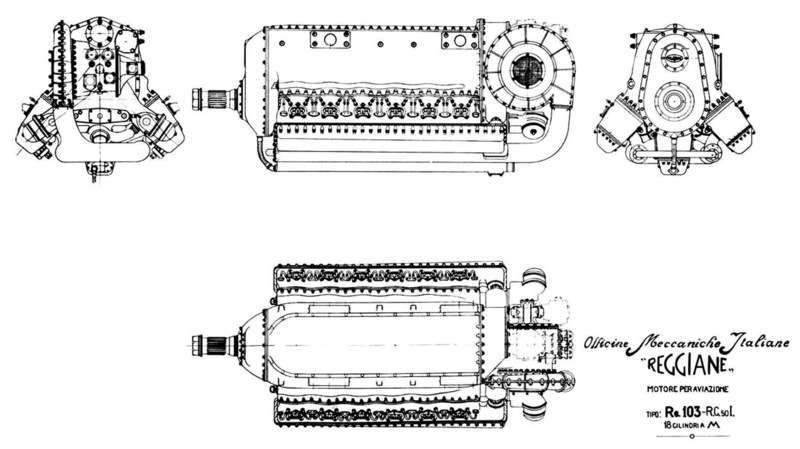 Undated three-view drawing of the Re 103 RC50 I engine. Note that it is listed as “18 Cilindri a M,” referring to its M-18 engine configuration. 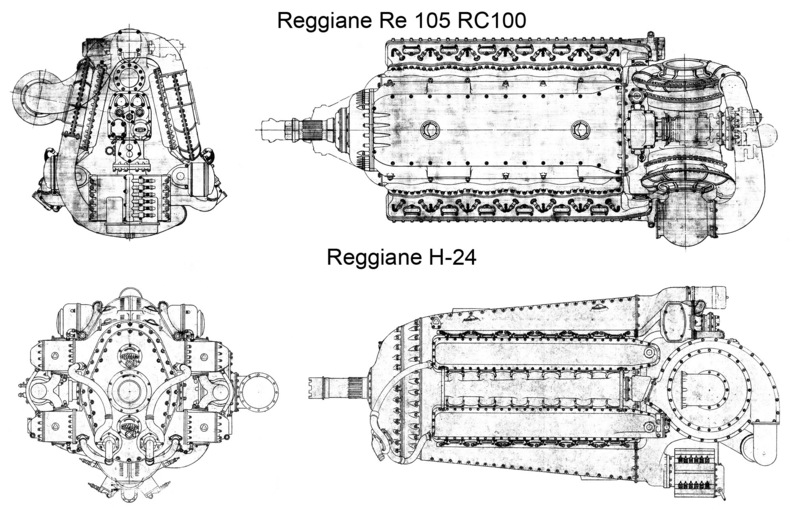 In 1940, Reggiane focused on their next engine design, the Re 103. Like the Re 102 RC50 I, the Re 103 was an inverted W-18. However, with a bore of 5.51 in (140 mm), a stroke of 5.67 in (144 mm), and a total displacement of 2,435 cu in (39.9 L), the Re 103 was a larger engine than the Re 102 RC50 I. The Re 103 had a 6 to 1 compression ratio and a .511 propeller gear reduction. The engine was 91 in (2.33 m) long, 38 in (.97 m) wide, 36 in (.91 m) tall, and weighed 1,874 lb (850 kg). The Re 103 RC50 I was a candidate for the Reggiane RE 2005 fighter, along with a few other projects. Although an independent design, the Reggiane Re 103 was in some ways similar to the Daimler-Benz DB 600 series engines. Both the DB 600 series engines and the Re 103 were inverted, had the supercharger impeller mounted parallel to the crankshaft on the upper left side of the engine, and featured fuel injection controlled by a module at the rear of the engine. Reggiane did have access to DB engines because licensed-built versions of the DB 601 (Alfa Romeo RA 1000 RC41 I) and DB 605 (FIAT RA 1050 RC58 I) were used in the RE 2001 and RE 2005 fighters respectively. Front and rear of the Re 103 RC50 I engine. In the front view, note how the intake manifold feeds the individual cylinder banks. In the rear image, note the fuel injector distribution pump and the various fuel lines leading to each cylinder. Air from the Re 103’s supercharger flowed through two manifolds positioned in between the engine’s cylinder banks. The left manifold supplied air to the left and center cylinder banks, while the right manifold provided air to the right cylinder bank. The manifolds met at the front of the engine, forming a loop. To keep frontal area to a minimum, the cylinder banks were positioned 40 degrees apart. Each cylinder had two intake and two exhaust valves. The valves were actuated by a single overhead camshaft. Each of the three camshafts (one for each cylinder bank) was driven by a vertical shaft at the rear of the engine. Also driven from the rear of the engine were the two magnetos that fired two spark plugs for each cylinder. The spark plugs were positioned on the outer side of the left and right cylinder banks and on the left side of the center cylinder bank. The fuel injectors were positioned on the inner side of the left and right cylinder banks and on the right side of the center cylinder bank. Two versions of the Re 103 were initially proposed. The Re 103 RC50 I had a three-speed supercharger and was intended for fighter aircraft, while the Re 103 RC40 I had a two-speed supercharger and was intended for bombers. The supercharger was designed to automatically change speed according to the aircraft’s altitude. The Re 103 RC50 I used 100 octane fuel and produced 1,740 hp (1,298 kW) for takeoff at 2,840 rpm with 7.2 psi (.49 bar) boost and 1,600 hp (1,193 kW) at 16,400 ft (5,000 m) with 4.6 psi (.32 bar) boost. The Re 103 RC40 I used 87 octane fuel and produced 1,700 hp (1,298 kW) for takeoff at 2,840 rpm with 6.4 psi (.44 bar) boost and 1,500 hp (1,119 kW) at 13,123 ft (4,000 m) with 3.4 psi (.24 bar) boost. Left side of the Re 103 RC50 I engine displaying the supercharger mounted in a very similar manner as on the DB 600 series engines. Of course, no engine mounted cannon could be used on the W-18 Re 103 engine. Three Reggiane Re 103 RC50 I engines were ordered by the Ministero dell’Aeronautica (Air Ministry) for the Regia Aeronautica (Royal Italian Air Force). A prototype Re 103 RC50 I was built by April 1942 and ran later that year. Development of the Re 103 inspired two additional and very similar engines, the Re 103 RC57 I and the Re 105 RC100 I. Both of these engines had the same configuration and displacement as the Re 103. The Re 103 RC57 I weighed 2,061 (935 kg), and its supercharger was optimized for 18,700 ft (5,700 m), where the engine produced 1,405 hp (1,048 kW). No orders were placed for the Re 103 RC57 I. The Re 105 RC100 I engine had a two-stage supercharger and was optimized for 32,808 ft (10,000 m), at which altitude the engine produced 1,310 hp (977 kW). The two-stage supercharger was essentially made up of two separate superchargers. The first stage was located on the right side of the engine and mirrored the second stage, which was located in the original Re 103 supercharger position on the left side of the engine. Air flowed through a tube from the first stage, around the back of the engine, and into the inlet of the second stage. The Re 105 RC100 I weighed 1,984 lb (900 kg). Three Re 105 RC100 I engines were ordered in 1943. The complete Reggiane Re 103 RC50 I engine in October 1943. The 18-cylinder engine produced 1,740 hp (1,298 kW) for takeoff. Three other engine designs were studied in 1941 while the Re 103 was being built. The Re 104 RC38 was the first, and it was a V-12 that produced 1,100 hp (820 kW) at sea level. The engine was derived from the Isotta Fraschini Asso L.121 RC40 but with a two-speed supercharger. The Re 104 RC38 had a 5.75 in (140 mm) bore and 5.67 in (160 mm) stroke. Its total displacement was 1,765 cu in (28.9 L), and the engine was intended as a possible alternative to the DB 601. No examples were built. The second design study was for a 24-cylinder engine using four Re 103 cylinder banks in a horizontal H configuration. This design allowed many parts to be interchangeable with the Re 103 engines. Reggiane’s H-24 engine produced 2,200 hp (1,621 kW) at 19,685 ft (6,000 m). If the 24-cylinder engine had the same bore and stroke as the Re 103, it would have had a displacement of 3,247 cu in (53.2 L). The last engine under study was a two-stroke diesel of unknown specifics. The H-24 and the diesel did not progress beyond the initial design. Top—rear and top views of the Re 105 RC100 engine. Note the two-stage supercharger arrangement. The outline around the front of the engine was for a proposed long gear reduction that added 6 in (.15 m) to the engine’s length. 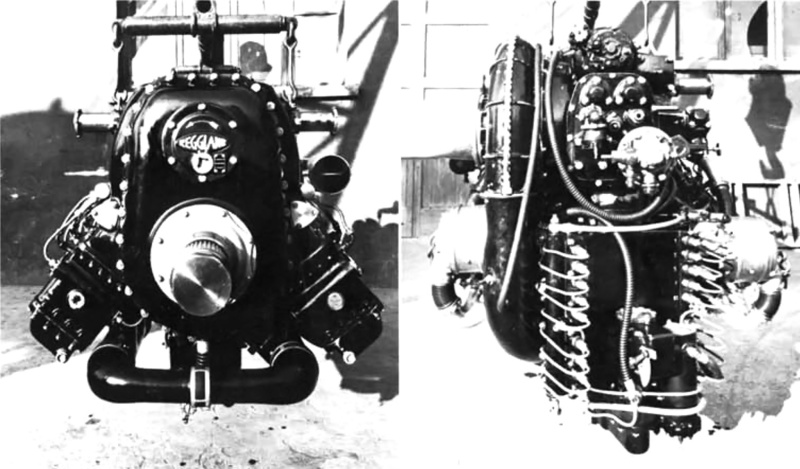 Bottom—front and side views of the H-24 engine. Note the crankshafts rotated clockwise (when viewed from the rear), and the propeller shaft rotated counterclockwise, just like the Re 103 and Re 105 engines. At least two Re 103 engines were built, and most likely they were both Re 103 RC50 I engines, but development was slow. Construction had also begun on the Re 105 RC100 I. Italy’s surrender on 8 September 1943 brought an end to all of Reggiane’s engine programs. After the surrender, Reggiane’s northern factories were under German control and manufactured parts for the Daimler-Benz DB 605 and other engines. The Germans were not interested in the Re 103 or other Reggiane engines, and developmental activity was not continued. *Italian aircraft engine naming convention varies by source. As an example, the punctuation, capitalization, and spacing of the Re 101 RC50 I designation can vary and still refer to the same engine, as in RE-101R.C.50 I or Re.L 101 R.C. 50 I. The Reggiane RE 2005 fighter was a potential candidate to be powered by the Re 103 engine. Only about 48 examples of the aircraft were built, and they were powered by the 1,475 hp (1,100 kW) FIAT RA 1050 RC58 I (licensed-built Daimler-Benz DB 605). This entry was posted in Aircraft Engines, World War II on 31 August 2015 by William Pearce.